Hundreds of volunteers spend countless hours making sure the trail remains in tiptop shape in Maine. TOWNSHIP A, RANGE 10 – The Appalachian Trail boasts 281 miles of Maine woods and rocky wilderness where hundreds of thru-hikers are finishing the 2,184-mile trek on Mount Katahdin. But the back story to the 14-state-long woods path that turned 75 this year is the individuals and hours spent maintaining the trail. When the trail was completed in 1937, it was, more or less, fashioned in haste, said Lester Kenway, the Maine Appalachian Trail Club president. What would come after was decades of upgrades, improvements and new methods to sustain the trail indefinitely. Don Miskill of Harpswell, left, volunteers on the L.L. Bean section of the Appalachian Trail with Lisa Richard, middle, and Laurie Gonyea. 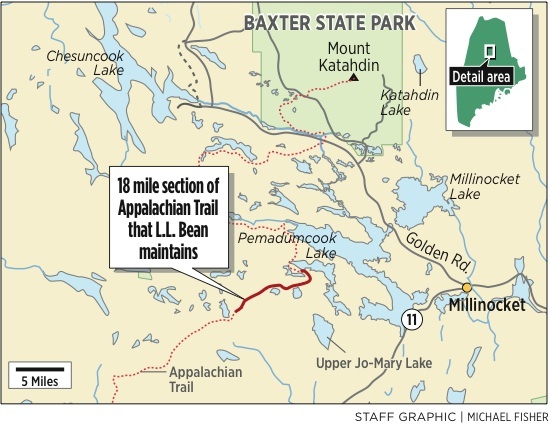 “The Appalachian Trail was constructed in about seven years in the 1930s, and then it was substantially revamped in the 1970s and ’80s,” said Kenway, a former Baxter State Park trail maintainer who has been working on the AT since 1971. What has kept the trail open and clear and an unhindered footpath are the hundreds of volunteers who adopt sections and repeatedly cut, haul and clear trees that fall across or grow into the trail. 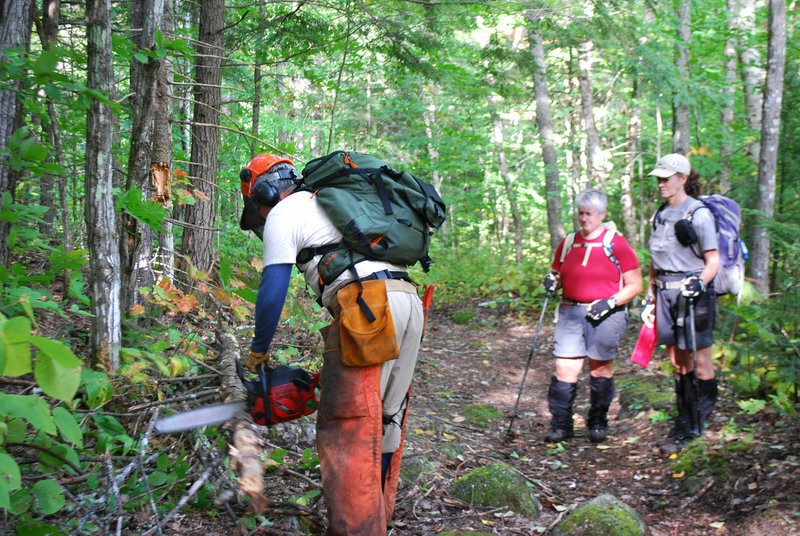 In Maine, the tradition of this volunteer effort is as storied as the trail itself. L.L. Bean’s crew is a good example, gathering together twice a year for 32 years to maintain a section of the AT in the 100 Mile Wilderness. Their story of a monumental effort tells of a tedious, backbreaking and constant job that unites hikers. “We’re like family. I wouldn’t have known these people if I hadn’t worked with them on the trail,” said Laurie Gonyea, an L.L. Bean trail leader. Gonyea, who works in human resources, and trail leaders Lisa Richard, a 17-year volunteer who works in the product department, met and became hiking buddies on the trail doing the work. They hiked together across Maine and even out in the Grand Canyon. It’s the typical AT phenomenon, the way the trail brings people together. “We have similar interests, a concern for the outdoors that bonds us together whether people here are from management or the assembly line,” said Tom Giggey, a five-year volunteer whose wife works for the company. Most on the Bean team are employees or former employees, but some are family of the company’s volunteer work force. Sometimes crews number as few as half a dozen and other times there are as many as 25. Either way the avid hikers work 10-hour days mowing through trees that fall across the trail, which happens often. On a 3-mile section of trail last Saturday, they cleared several large trees. But the trail needs more rigorous work. Bog bridges last little more than a decade, but the more firmer stone and rock causeways, the backwoods versions of sidewalks, can last a lifetime if designed right. When possible, Richard said, the group tries to construct as many of these as possible, when the work of clearing the trail is done. Hardening the AT where it’s wet or boggy extends its life. New England is a damp place and the Appalachian Trail suffers. As much as 10 percent to 30 percent of the trail in Maine is in need of hardening, Kenway said. But the AT is a constant project, what Kenway called a long-term relationship. All told, he said, the AT in Maine is in pretty good repair after 75 years. “We have what is often called the most wild section of the Appalachian Trail. We’re proud of that,” Kenway said. 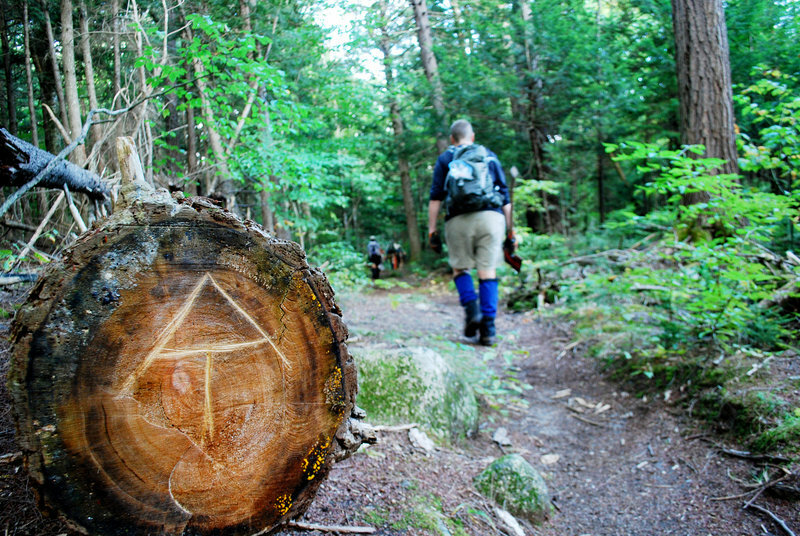 Today, 115 sections of the AT in Maine are adopted and cared for by volunteers. And when these caretakers can no longer do the work, the sections that go up for adoption never stay in need of a steward very long. “We post it on our website. 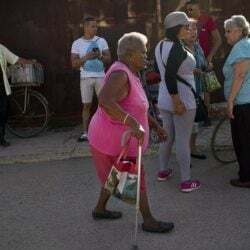 Within six to seven months, they’re adopted again,” Kenway said. “We’re keeping up pretty well with general maintenance.